I was recently asked about my take on hashtags. I have written about hashtags before, whether it be their role within Twitter, the way in which they help foster sets and a reflection on what they mean to my own workflow. While I have been influenced by Jon Dron, Terry Anderson, Clive Thompson, Ian Guest and Kevin Hodgson. Here then is a summary of the different uses that have meaning to me. 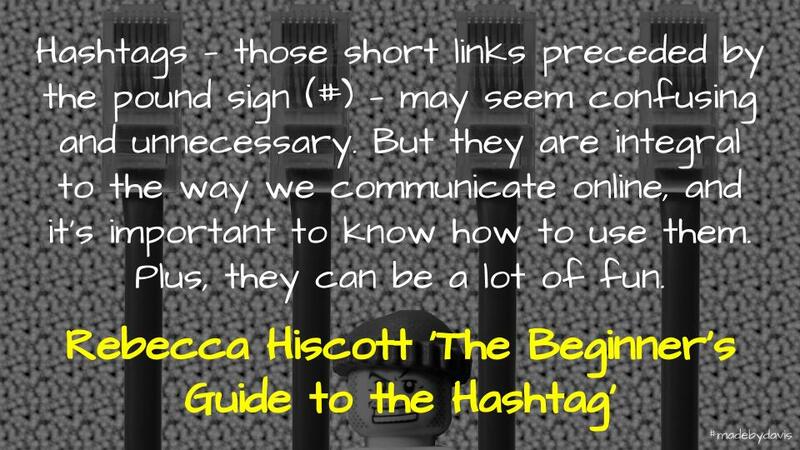 CHATS: The obvious use of hashtags, especially when it comes to education, is as a means of facilitating a chat. This is personified by Tom Whitby and #edchat. These are used at specific times designated by organisers and archived using applications such as Storify. TRIBES: Extending from the chat is the use of hashtags to collect together tribes. In Teaching Crowds, Jon Dron and Terry Anderson describe tribes as communities bringing people together around complex ideas and interests, tied together by certain rules and expectations. Jerry Blumengarten is oftwn quoted as the definitive source for hashtags. However, more recently Kasey Bell has attempted to update this. Although many of these hashtags are associated with chats, they are not confined to that and often take on a life of their own outside of them. Sometimes the challenge with using what seems like the ‘right’ hashtag is that it is difficult to remember every common hashtag, while it seems tedious to go check lists all of the time. RANDOM TEMPORAL CONNECTIONS: Similar to the idea of an in joke, where what is being said only makes sense when privy to the context behind it. Two that come to mind are #whereisHa and #TwodayswithElton. Based on the idea of Where’s Wally, #WhereisHa was started by a group of participants at DLTV14 when Michael Ha was running late having just flown back into Australia from USA. #twodayswithelton was a tag between Ross Halliday and I leading up to Google Teachers Academy a few years ago. It started when Ross said that I looked like Elton John. We then started a swapping lyrics that acted as something of a sidechat to the official #GTASyd14 hashtag. This informal ad-hoc use is captured by Dean Shareski in his discussion of a more playful Twitter. Another temporal use is also a hashtag around a particular event, whether this be a conference or a camp. EMOTIONS: A different take on the informal is the use of hashtags to capture emotions or responses. This is best demonstrated in Instagram, where everything seems to be interconnected through hashtags. However, it is used on Twitter to highlight various attributes, such as #longread, #trust and #leadership. Personally, I don’t really think that I use hashtags that effectively. Fine I have a few ‘go tos’, such as vicpln, digilit, edchat, leadwild, edtechteam, disruptedu and gsuiteedu. However, beyond that I don’t really actively use them unless i have clear reason. There are some that seem to methodically share their posts across a range of tribes by including five tags in Tweet. I also tried to game Feedly by placing blogs into categories that would automatically be turned into a tag. There are some that I used to use quite a bit, such as #rhizo14, #TL21c and #ccourses. However, over time these tribes have seemingly moved away. Interestingly, these tags were associated with courses. This in itself may say something. So what about you? What do hashtags mean to you? As always, comments welcome. Did Someone Say … Hashtags by Aaron Davis is licensed under a Creative Commons Attribution-ShareAlike 4.0 International License. Thanks, as always, for provoking my thinking. You make a number of interesting points here, but I’ll try to keep things tight by restricting my query to just one. You mention the use of hashtags in the context of emotions; I never thought about that! Are you saying the hashtags are used here in a similar way to emoticons? To imbue a tweet with a sense of emotion … but perhaps with more subtlety than an emoticon might? If that is the case, why do people feel the need to do that; what’s the gain or payback? And for whom? That is an interesting question Ian. I want speak for everyone, but from my point of view I think that it comes back to expression. I just returned from New Zealand where they use a lot of Maori words to capture various attitudes and attributes. I think that hashtags are somewhat similar. They offer a different form of expression. For example, on Instagram, I often use #whostheboss when I take pictures of my children. Having said all this, I think that it is a reminder that we can list the features and affordances, but there will always be someone, somewhere who will subvert these. It\’s Complicated by danah boyd encapsulates a lot of this. There is no doubt that I use hashtags for the “tribes” or community purpose. Your post made me think a bit about that, and I came to the realization that that’s almost the only time I use a hashtag. Thank you for your useful analysis. Now I will need to further analyze my own use. Your post makes me think I may be avoiding hashtags. To be fair, there are times when I avoid using hashtags too and like lurking, there almost needs to be a separate section for this.